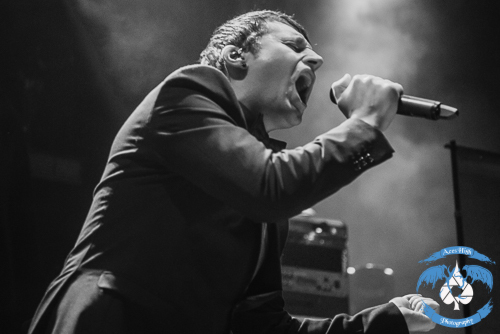 THEORY OF A DEADMAN, FOZZY, 3 PILL MORNING Live In Cleveland, Ohio With Photos! Cameras in tow, I headed up to Cleveland once again to the House of Blues to catch a show. Up first was the Minnesotan quartet 3 PILL MORNING. This was my second encounter with the group and they really impressed me this go around. 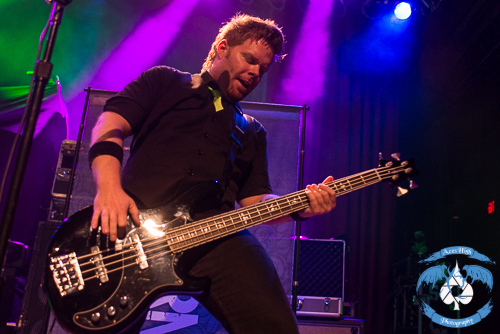 Although the band’s guitarist, Aaron Peterson, had left for Minnesota for the birth of his daughter, the axe-men of FOZZY filled in flawlessly. Rich Ward, Billy Grey and Jeff Rouse all took turns filling in so that 3 PILL MORNING could go on with the show. Vocalist Jeff Stebbins was very entertaining, constantly jumping, pumping up the crowd and urging their participation. I can’t really pinpoint why, but 3 PILL MORNING came off as being much more aggressive than the last time I saw them, which, of course, is a good thing. Definitely get out and catch them as they hit the road supporting IN THIS MOMENT this fall. I was pretty excited to finally get to see FOZZY. Everyone knows who Chris Jericho is, but I wanted to see if he truly could pull off being a frontman, as opposed to grappling in the ring. A unique remix of BLACK SABBATH’s “War Pigs” played as the band took the stage. They kicked off the set with the title track off of their new album, Do You Wanna Start A War. 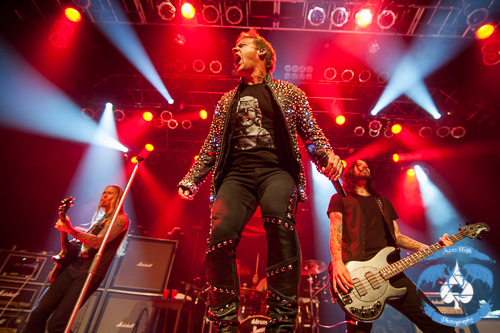 Chris Jericho made his way to center stage draped in a sequin jacket with small LED lights emitting from it. The energy from the band was rubbing off on me. You couldn’t help but admire their charisma and chemistry. Chris never stopped in pursuit of commanding the audience’s attention. Not only did FOZZY bring the energy, but they were able to back it up with excellent playing. Guitarists Billy Grey and Rich Ward traded screaming solos back and forth throughout the set. During the song “Bad Tattoo”, which is a killer song that takes on a whole new life when done live, Rich busted out the theremin. This was the first time I saw anyone use a theremin live since Frank Hannon utilized the often-overlooked instrument in TESLA’s performance of “Edison’s Medicine”. It was a nice little addition to the already slamming set. blew me away and I can’t wait to catch them live again. Unfortunately the same can not be said for tonight’s headliner, THEORY OF A DEADMAN. 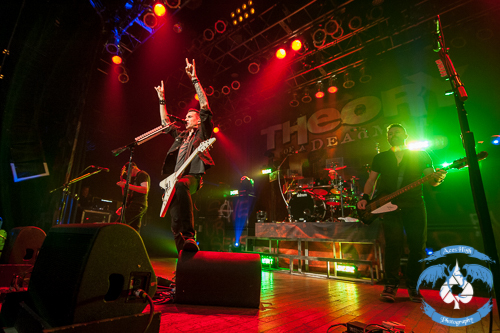 THEORY OF A DEADMAN took the stage to the hit song “So Happy”. I will give them the benefit of the doubt, but the guys in THEORY OF A DEADMAN just did not have it tonight. It started with the mix. For whatever reason, the entire set was dominated by the bass in the mix. The vocals and guitars were way too buried and muddy, for which I can’t really fault the band. When I was down in the photo pit for the first three songs of the set I could hear Tyler Connolly’s vocals clearly in his monitors and they were often off key. I am not trying to rip apart the band, but clearly this was just not their night. That is not to say that they aren’t very capable musicians. Take one look at their catalogue of hits over the last twelve years and their talented song-writing abilities become obvious. It is all relative, too. Trying to follow up the excellent performance of FOZZY was a daunting task to begin with. These were all my observations, but the majority of the sold-out crowd seemed to think otherwise. The capacity crowd was as rowdy as ever. I had a really tough time just getting into the photo pit because people had packed themselves so tightly up front. At times it was difficult to hear Tyler’s vocals over the crowd as they sang along. You don’t really realize how many hits the band has had over the years until they pack them into one set. Tyler and band mates, Dave Brenner and Dean Back, surveyed the crowd all while constantly feeding the fans with guitar picks. Seriously, Rick Nielsen has nothing on these guys. I have never seen so many picks. THEORY OF A DEADMAN finished their encore with “Bad Girlfriend”. The night belonged to FOZZY, but I believe that THEORY OF A DEADMAN will iron out the kinks for future shows. My hope is that this was just an off-night accompanied by some issues with the house mix.